Having established itself in France in 2004, in the following years the Asian hornet decimated the bee population there and brought beekeeping to its knees. In 2013, it had already established itself throughout the French coast and into the west coast of Italy, giving the Ligurian coast the name ‘the red zone of Italy’. It is precisely in this area that the pressure of this flying pest on beehives is most overwhelming: from dawn to dusk, hundreds of Asian hornets hover in close proximity to beehives, constantly attacking and killing bees. The constant presence of Asian hornets in the apiaries is a serious threat, not only because they pray on bees but also because of the distress they cause. In fact, the bees are so terrified that they no longer fly out of their beehives and no longer lay eggs. They become weaker and weaker and, eventually, their entire families collapse. What can be done to defend the bee against this horrendous flying pest? The best defence weapon is trapping, a fundamental practice that effectively slow down the growth and spread of the Asian hornet population. To understand this point, it is necessary to acknowledge the habit of this flying pest. For an effective use of Sfera Trap against Vespa velutina, it is necessary to use two kind of baits on it, depending on the season. While at the end of winter we must use sugary baits, in summer, when the population of Asian hornets increases, we must use protein baits instead. The hibernation period for queen Asian hornets starts at the beginning of winter, when they are fertile and have already mated. They find shelter in safe cavities, such as in heaps of wood or rotten tree trunks, and in putrid or damp areas. Their hibernation period ends at the end of winter, when they leave their shelters famished and in need of sugary substances (which they find in pollens, flowers etc.) They need to recover their strength so that they can build new nests for future colonies. It is precisely at this time that the bio traps need to be placed. By capturing a few queens of this dangerous species at the beginning of spring, we thwart the birth and development of thousands more: the colonies of Vespa velutina can contain up to 6000 individuals, and each colony can produce between 180 and 500 queens! This early spring trapping is thus preventative and very important; it is done by placing bio-traps with sugary food baits in the first days of sun at the end of winter. In this way the trap becomes a perfect attractant to the queen Asian hornets and can thus contribute to the capture of the matriarch-makers of new colonies, thus preventing the birth and development of thousands of new individuals. Here you can find some advice on how to use the bio-traps. The use of bio-traps is essential for the capture of this predatory insect: we must avoid the risk of trapping bees or other insect pollinators - a risk that becomes unavoidable when using chemical baits, which are non-selective and make no distinction between bees and wasps. Indeed, to date there has been no research aimed at developing a selective system that would both target Vespa velutina and protect bees and useful insects. The food baits that we have successfully tried for our bio-traps, and can recommend, do not attract pollinators and other useful insects, which do not like this kind of substances. This point will be elaborated further in what follows. Food based bio-traps for Vespa velutina, such as Tap Trap and Vaso Trap, are already being used with success in those countries where this flying pest is present (and namely France, Germany, Balearic Islands, Spain, Belgium and Portugal.) The selective attraction they provide is due to the content of their baits: these do not contain substances that are liked by insect pollinators: one of the baits, for instance, is made with light beer (not dark though) - the best being beer with 4.7% alcohol content. Vespa velutina seeks sugar-based nutrients (which are contained in beer) and the end of winter is the ideal time of the year to place bio traps with this kind of bait. Furthermore, this bait is cheap and above all it is natural and eco-friendly. The traps for Vespa velutina can be placed anywhere: in the countryside, in the garden, in the city, and in campings. Indeed, unfortunately Vespa velutina makes its nest just about everywhere. The traps can also be placed on beaches at holiday resorts: in summer time Vespa velutina is also attracted to fish - for the proteins it provides - and that is why it is also present in close proximities to these areas. Thanks to bio-trapping it is possible to monitor the presence of Vespa velutina. The transparency of beer-based baits allows us to recognise each individual insect that has been captured. By emptying the content of the traps we can then find out whether we have succeeded in trapping Vespas velutina or we have caught only European wasps and hornets. This is how our bio-trapping can also become monitoring. Towards the summer however, the habits of this predator change, and this is when it inflicts the most tangible damage to bee populations. It is usually towards summer (but it depends on climate and area) that the queen Vespa velutina - which by that time has made its nest and laid its eggs - no longer flies out, it instead stays inside the nest to incubate the eggs. It is the turn of the workers to fly out in search of food. By this time, they need more than just sugary substances: they also need protein food to feed the larvae back in the nest. That is when beer-based sugary baits are no longer sufficient to attract and trap this predator. Amongst the various protein substances that Vespas velutina seeks and finds, are the bees, which it particularly likes. To hunt them, it hoovers in front of beehives, waiting in ambush for the forager bees to come back home, heavy with the polline collected and therefore less agile and more vulnerable. When overwhelmed by hunger, and in the absence of oncoming foragers, the worker Vespas velutina abandons the ambush and attacks instead any bee that dare coming out of its hive. This is when our precious friends become utterly distressed and, scared and unable to defend themselves, no longer dare to fly out of their beehives. It is in this period then that we need to reduce the pressure caused by Vespas velutina on beehives. At present, the only bio trap that is able to do that is Sfera Trap: the first glue-trap to be used with protein baits (these can be, for instance, fish pate) and that can be positioned directly in the apiary. Sfera Trap is a highly selective trap; it should not be hung on trees like Tap Trap: it should be positioned either above or between beehives (but never in front of beehives and never within the flight paths of incoming bees). It is very important to use Sfera Trap in the apiary without its LED light, otherwise we run the risk that during the night the bees may also be attracted to it. The protein trap for the Asian hornet Sfera Trap, if properly used significantly reduces the number of predators flying in front of the beehives (learn more here). To achieve this goal, the traps should be positioned at the first sign that the pressure of this harmful predator on beehives has increased. We should keep them in place approximately until the end of summer, when Vespa velutina begins to prefer sugary substances to protein again. This highly selective system is also effective for Vespa crabro (European hornet), which in the warmer months of the year adopts the same behavior as velutina besieging apiaries to hunt bees. Sfera Trap has been tested for three years in western Liguria (the area of Italy that has been most affected by the invasion of Vespa velutina) with excellent results. 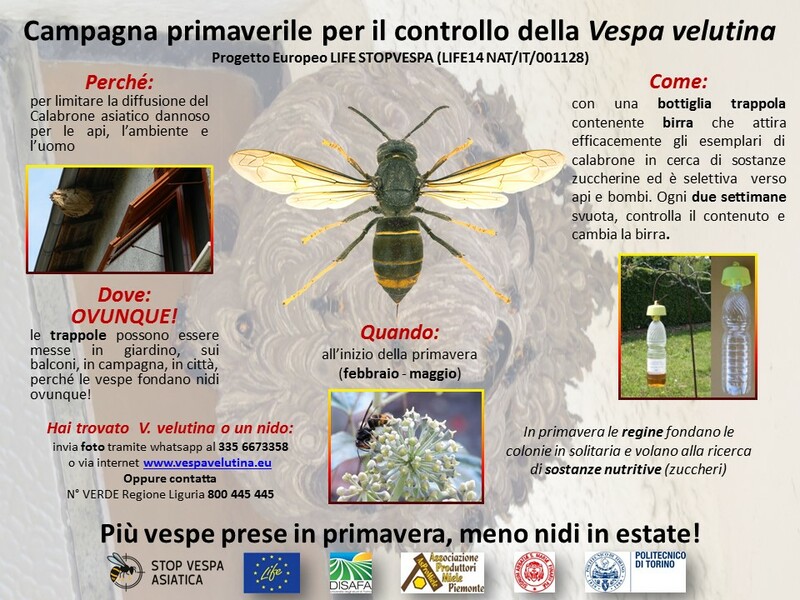 In 2015, in close collaboration with beekeeper associations, and local and national institutions, the LIFE STOP-VESPA was born: a project that aims at organising continuous monitoring networks of Vespa velutina, and aims at prompt intervention. Parts of the funds allocated for this project enabled the purchase of our Tap Trap bio traps, which were then used to establish the monitoring network of Liguria and Piedmont apiaries. This made possible the finding that the preventive trapping of queen Asian hornets significantly contributes to the decrease in their number and, consequently, of the colonies present in these areas. Today we can confidently say that in Italy the spread of this harmful predator has been slowed down. We must place the traps already at the end of winter. In order to trap Vespa velutina, we must use beer. We simply pour the content of half a can of light beer (not dark) inside an empty plastic water bottle, then hook Tap Trap onto its neck (here is how to do it) and hang it on a branch of a plant, about 2 meters from the ground, possibly in the middle of the land. Just unhook the bottle from tap-trap and empty its content into a colander inside a sink or in the garden. This way you will be able to better identify the captured insects. It is extremely important to periodically check the bio-traps, and not only to assess what has been captured: for various reasons, the bait may lose effectiveness and in that case it is necessary to replace it, either by emptying the bottle and pouring new bait into it, or by replacing the whole plastic bottle with a new one - the difference being that the bottle with dead insects that we have emptied will retain the old smell, thus making the trap even more attractive to these flying pests. This last option can be carried out more easily using Vaso Trap. What happens if I do not periodically check the bio traps? The trap becomes full to the brim with wasps, hornets, and other insects, which begin to macerate; the smell that is thus created replaces the initial sugary scent, and when this happens the bait is no longer attractive to wasps but becomes an attractant for flies instead. The bait, left for too long in the trap-bottle loses its sugary scent. This happens even when there are only few insects - or none - in it. Above all, if the insects are left for too long and they macerate, they will no longer be recognisable when the trap is emptied, making it impossible to identify any Vespa velutina among them. The bait should always be checked and replaced when there are too many insects inside or in any case every 15-20 days.